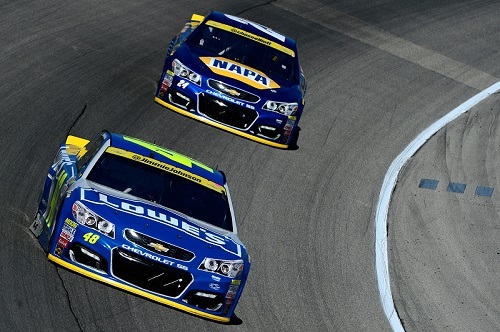 Jimmie Johnson (48) leads Chase Elliott at Chicagoland Speedway on Sept. 18, 2016 (photo courtesy of Getty Images for NASCAR). NASCAR continues to tweak its penalty structure in relation to post-race laser inspection. On Wednesday, the sanctioning body announced that teams will only be penalized as a result of post-race laser inspection results if they commit “egregious” infractions. Those infractions are classified as P4 or higher on NASCAR’s penalty scale. The No. 78 Furniture Row Racing Toyota of Martin Truex Jr. and the No. 48 Hendrick Motorsports Chevrolet of Jimmie Johnson both failed post-race laser inspection Sept. 18 after the Teenage Mutant Ninja Turtles 400 NASCAR Sprint Cup Series race at Chicagoland Speedway in Joliet, Ill., but no penalties were handed out to either team with NASCAR stating that their cars were just barely outside legal specifications. Previously, P2 or P3 penalties for minor post-race laser inspection failures included championship points deductions and fines for crew chiefs. Truex won the Chicagoland race, and as a result, will automatically advance to the second round of the Chase, so a points penalty would have no effect on his championship efforts at this point in the Chase. Johnson, without a Chase win, though, could see his title shot affected by a points deduction. While NASCAR has done away with issuing penalties for P2 and P3-level infractions from post-race laser inspections, it has beefed up possible penalties for more “egregious” infractions discovered post-race, including taking away race-winning benefits, including automatic advancement to the next Chase round. Other penalties will include the loss of 35 points and a $65,000 fine. Also, for the remainder of the Chase, all cars still competing in the Chase through each round will undergo post-race inspections. Previously, only top finishers and a randomly-selected car underwent post-race inspections. NASCAR also has put its foot down on drivers swerving their cars on cool-down laps after the races, as the move could put an out-of-tolerance car back within NASCAR specifications. The same changes also apply in the NASCAR Xfinity Series. Competitors in the NASCAR Camping World Truck Series, though, do not undergo laser inspections.